What is Openbravo Commerce Suite? 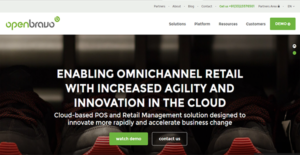 Openbravo Commerce Suite is a single solution for managing multi-channel and multi-location retail commerce. It is fast and efficient in responding to users’ commands to let them perform tasks quickly. With Openbravo Commerce Suite, businesses can leverage the cloud technology that supports the mobility of the workforce. With that, companies can achieve enhanced efficaciousness in all levels of their operations. Moreover, since Openbravo Commerce Suite is a modular platform, retail businesses experience lower risks while performing at an optimum pace. This is facilitated by the solution’s ability to maintain and upgrade the system simply and smoothly. Openbravo Commerce Suite affords developers a stable platform for robust development. It is also equipped with an open source stack for that reason. In addition, it has automation capabilities that let users become more efficient and more productive in conducting their daily workflows. With Openbravo Commerce Suite, end-users can enjoy an enhanced productivity. That is made possible by user-friendly features that allow for easy navigation of the platform. One of these is the tree navigation that displays menus in a hierarchical manner. That way, users can easily find their way around the software. Openbravo Commerce Suite paves the way for streamlined operations beginning with the development stage. That is because the platform employs a metadata-based approach that increases application development speed. Moreover, the solution has an integrated Application Dictionary where developers can swiftly and easily create and manage metadata information. With that, development is made more efficient. As Openbravo Commerce Suite is built on a modular architecture, it has the ability to deploy optional components without interrupting pre-existing processes. Rather, it further optimizes them as new additions lend their capabilities for the augmentation and simplification of administration. Openbravo Commercial Suite assists businesses in creating connections with other solutions swiftly. By doing so, their software workflows become more connected as they can smoothly transfer and exchange information through their integrated applications. Openbravo Commerce Suite has an integrated mobile solution based on multiple technologies. As such, operations are able to continue seamlessly despite users being on the go. Moreover, mobile employees can continue working even without an internet connection—the platform takes care of synchronizing their data to the cloud once the connection is restored. Embedded in the Openbravo Commerce Suite are intelligent, open source BI technologies. These let users make complicated queries that yield accurate and actionable results. With reports generated by these, leaders can make the best and well-informed decisions for the company. If you are interested in Openbravo Commerce Suite it might also be beneficial to investigate other subcategories of Best Apparel Management Software listed in our base of B2B software reviews. Every company is different, and can call for a specific Apparel Management Software solution that will be designed for their company size, type of customers and staff and even particular niche they support. You should not count on getting an ideal app that will work for every business regardless of their history is. It may be a good idea to read a few Openbravo Commerce Suite reviews first and even then you should keep in mind what the service is supposed to do for your business and your staff. Do you need a simple and straightforward app with just elementary functions? Will you actually make use of the advanced tools required by pros and large enterprises? Are there any particular features that are especially beneficial for the industry you work in? If you ask yourself these questions it will be much easier to find a trustworthy service that will match your budget. How Much Does Openbravo Commerce Suite Cost? We realize that when you make a decision to buy Apparel Management Software it’s important not only to see how experts evaluate it in their reviews, but also to find out if the real people and companies that buy it are actually satisfied with the product. That’s why we’ve created our behavior-based Customer Satisfaction Algorithm™ that gathers customer reviews, comments and Openbravo Commerce Suite reviews across a wide range of social media sites. The data is then presented in an easy to digest form showing how many people had positive and negative experience with Openbravo Commerce Suite. With that information at hand you should be equipped to make an informed buying decision that you won’t regret. What are Openbravo Commerce Suite pricing details? What integrations are available for Openbravo Commerce Suite?